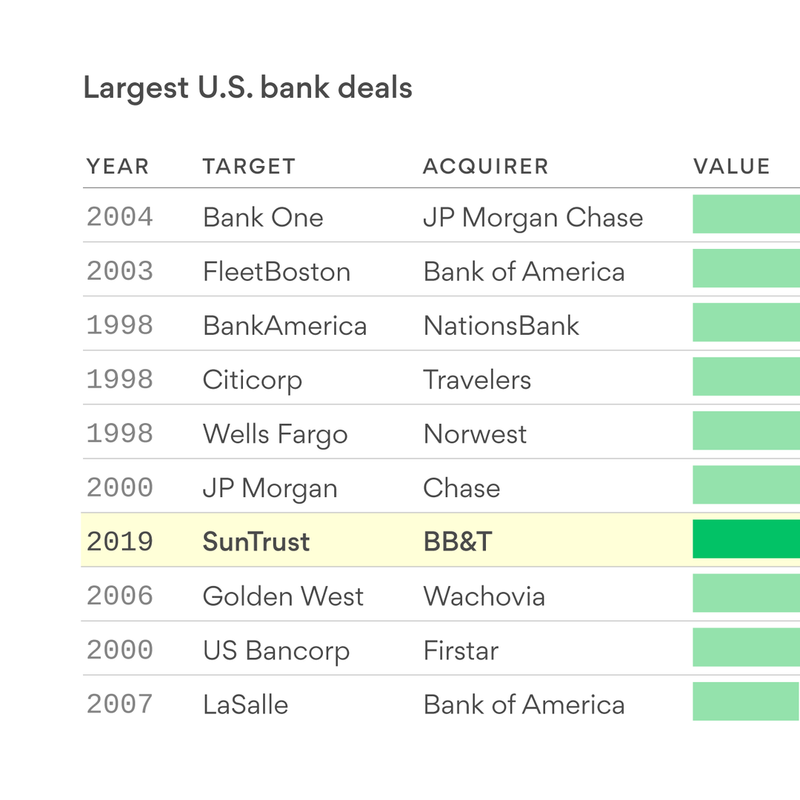 Data: Dealogic; Chart: Andrew Witherspoon/AxiosBB&T agreed to buy SunTrust Banks for $28.2 billion in stock, creating the country's sixth largest bank by assets and deposits. If approved, it would be the biggest U.S. bank merger since the 2008 financial crisis.By the numbers: The merged bank will have $442 billion in assets, with BB&T contributing a little more than $225 billion and SunTrust contributing the rest, WSJ's Justin Lahart writes: "A bank relief law passed last year raised the threshold for stricter oversight by the Federal Reserve to $250 billion in assets from $50 billion. With both banks on the verge of reaching that higher threshold, why not join forces and reap the cost savings of a merged entity? "Go deeper: Regional banks BB&T and SunTrust to merge in $66 billion deal.